Faith Lindsay ’12 says it’s been one of her favorite Butler experiences. This year’s FAB group traveled to Pipestern, W. Va. to volunteer at the Appalachian South Folklife Center. There they lived in bunk-style housing and worked with a family who had just purchased their first house. The group’s goal was to help the family get on their feet and create a better home for them by repairing and painting the entire house. 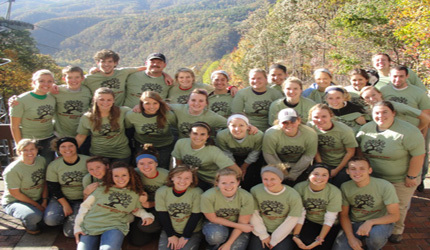 In addition to the service project, the students had down time to participate in cultural events and reflection activities, and hike through the Appalachian Mountains. They also listened to a speaker talk about mountain-top coal removal and its environmental impact on the Appalachian Mountains, as well as attended an interactive musical festival. In order to put together a successful FAB trip, the executive board works hard to select a site that promises meaningful service and provides a balance between cultural experience, manual labor and education. Serving on the board with Himes and Lindsay are Education/Reflection Chairs Alissa Kent ’13 and Paige Sjoerdsma ’13, and Fundraising Chairs Samantha Helferich ’14 and Hayley Jones ’14. Associate Director of PuLSE Julie Pakenham serves as the staff advisor. Himes was especially pleased with the outcome of this year’s trip and thought the trip ended on a very positive note.